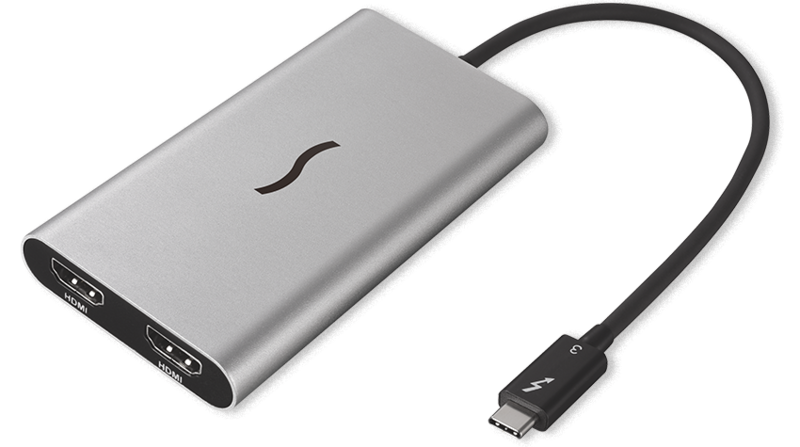 Certified for use with both Mac® and Windows® Thunderbolt 3 computers, Sonnet’s Thunderbolt 3 to Dual HDMI 2.0 Adapter enables you to connect up to two 4K @ 60Hz HDMI monitors to a single Thunderbolt 3 port on your computer(1). Sonnet’s Thunderbolt 3 to Dual HDMI 2.0 Adapter enables you to work more efficiently with two displays attached to your notebook or all-in-one computer, while only using a single Thunderbolt 3 port on your computer. To use it, simply plug in the Sonnet Thunderbolt 3 to Dual HDMI 2.0 Adapter into one of your computer’s Thunderbolt 3 ports, and then connect HDMI cables (sold separately) between the adapter and your monitors. Your computer powers the Sonnet adapter, so there’s no need to connect an additional power supply. Plus, with native macOS® and Windows support, there’s no need to install separate driver software. Enables You to Work More Efficiently—Fill one display with full-screen workspace; use the other for tools, other applications, etc. Thunderbolt Certified for Mac® and Windows(2), the Sonnet Thunderbolt 3 to Dual HDMI 2.0 Adapter supports two monitors at resolutions up to 3840 x 2160 (4K), but you can also use it to connect monitors with lower resolutions, like full HD 1080p (1920 x 1080) or 1920 x 1200 monitors. This makes it great for use for different home and office workspace applications. Because audio support is built in to the Sonnet adapter, you don’t have to plug in a separate cable to hear sound from the monitors. And, unlike USB adapters, the Sonnet adapter won’t drain system resources that might impact your computer’s performance. Although Sonnet’s Thunderbolt 3 to Dual HDMI 2.0 Adapter supports the connection of up to two 4K monitors with 60Hz refresh rates, the actual number of monitors it will support, as well as the screen refresh rates, are determined by your computer. Click here to view a list of Thunderbolt 3 hosts (computers) and their capabilities; please note that at any given time this list may not be complete. Click the appropriate Filter by Brand/OEM link, and then find your computer model. Check the center column to identify its external display support capabilities. If your model is not listed, contact your computer’s manufacturer for information. Not compatible with USB-C only ports. Not all Thunderbolt 3 computers support dual displays or 60Hz refresh rates. Visit this web page and click the Filter by Brand/OEM link matching your computer, and then locate your computer model to determine its capabilities. Please note that at any given time this list may not be completely up to date. If your computer model is not listed, please contact the manufacturer for information. 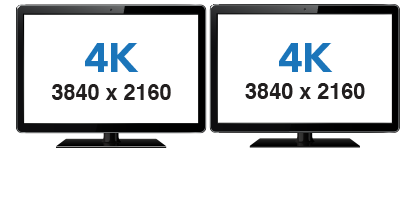 EDID stands for Extended Display Identification Data. This is how the monitor identifies its resolution modes to the adapter. EDID Version 1.4 was finalized in 2006. If your HDMI monitor is more than 10 years old, it will likely not be supported. Plug one into a left side port and one into a right side port.